Outdoor play is “critical for healthy whole child development,” according to the National Association for the Education of Young Children (NAEYC). Outdoor play includes playgrounds which provide many learning opportunities for babies, toddlers, and school-age children. Since the mid-20th century, there has been increased attention paid to the safety of playgrounds. Today, daycares, child care centers, and other facilities that maintain playgrounds must ensure that playgrounds meet specific safety requirements so that as many serious injuries as possible can be prevented. The majority of playground injuries happen at daycares and schools. Outdoor play areas are fenced. Outdoor play areas have at least 60 square feet of space for every child using the space. Outdoor play areas are free from litter, glass, garbage, and flammable materials. Outdoor play areas are safe from foreseeable harm, well drained, well maintained, in good repair, and visible to staff. Outdoor play areas have a protective surface for outdoor play equipment that is used to swing, climb, or slide. Outdoor play areas have a fall zone equal to the height of the equipment. Outdoor play areas be shaded and used at a different time than older children if infants or toddlers are using the space. Supports for climbing apparatus and other large playground equipment are securely fastened to the ground. Crawl spaces on playground equipment are large enough to fit an adult. Sandboxes have sufficient drainage, are covered when not in use, are kept clean, and are checked for vermin prior to usage. Child care centers have enough toys, playground equipment, and developmentally appropriate materials to provide each child with a variety of things to do during the day. Additionally, Kentucky daycares should comply with the guidelines set out in the U.S. Consumer Product Safety Commission Public Playground Safety Handbook, and Kentucky daycares should make sure that children are appropriately supervised on all playground equipment. Making sure that children understand how to use the playground equipment appropriately. This means not going up the slide or climbing onto the roofs of play structures, for example. Stopping any pushing, shoving, or fighting on the playground. Roughhousing can result in a dangerous fall or other accident that results in a serious injury. 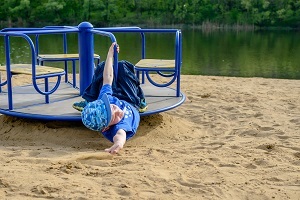 If your child has been hurt, then the cause of the playground accident and resulting injury may not be immediately clear. Who Is Liable When a Daycare Injury Occurs? The maintenance staff that is supposed to clean and maintain the playground. The manufacturer of the playground equipment. The installer of the playground equipment. In some cases more than one of these parties may be liable for your child’s injuries. We will identify the right party or parties and hold them accountable for the harm that has been done to your child by fighting for your child’s full and fair recovery in a daycare injury lawsuit. This may include compensation for past, current, and future medical expenses, physical pain, emotional suffering, and any other damages directly related to the playground injury. To learn more, please contact us via this website or by phone at any time. We would be pleased to schedule a free, confidential, no-obligation consultation with you. How Long Do I Have to File a Case If My Child is Hurt at Daycare? Posted on 07/23/2018 Has Your Child Suffered Sexual Abuse in a Kentucky Daycare?